I was asked by my mother what I wanted for Christmas and I really didn’t know. I went into a quilt shop on a whim looking for buttons. Their button selection was sad, but the store was enormous!! I had to take a look around. It was a slow day and the owner talked me into trying out a machine. I made 2 coasters. It was fun! I had not sewn since middle school. I received an ‘F’ on a drawstring bag and never threaded a needle again. I was a disaster! All that cutting a measuring, I figured it was not for me. I went back to the store the day after Christmas and picked this out. Its a beginner machine, which is perfect ’cause I don’t know what I’m doing! It’s so cute. 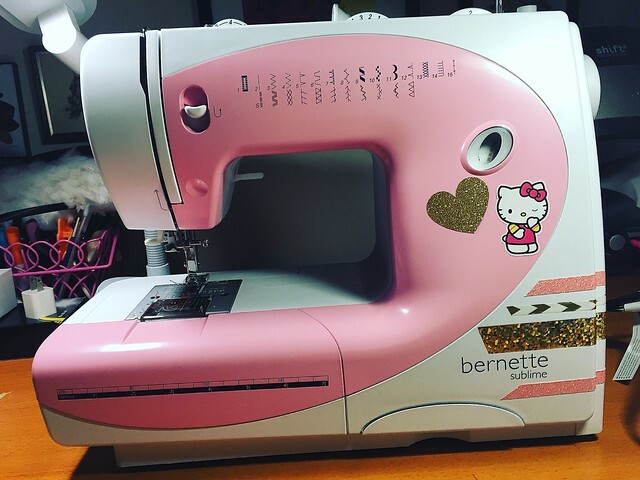 I fancied it up with washi tape and stickers 🙂 One day I will go back for a Bernina… which I get some skills…. and some $$$ LOL!